Researchers may have finally solved the mystery behind lunar swirls, one of the solar system’s most beautiful optical anomalies. The solution hints at the moon’s ancient past as a place with volcanic activity and an internally generated magnetic field. It also challenges our picture of the moon’s existing geology. Lunar swirls resemble bright, snaky clouds painted on the moon’s dark surface. The most famous, called Reiner Gamma, is about 40 miles long and popular with backyard astronomers. 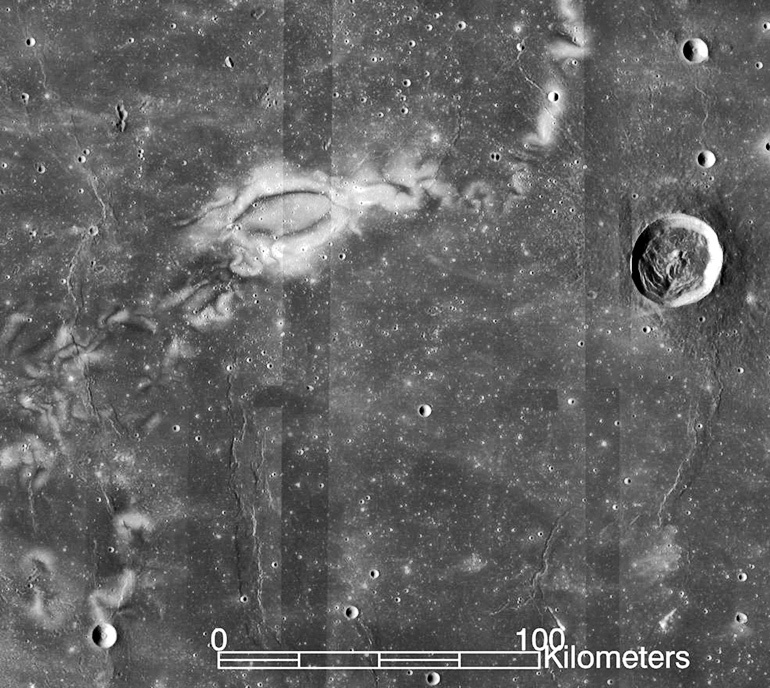 Most lunar swirls share their locations with powerful, localized magnetic fields. The bright-and-dark patterns may result when those magnetic fields deflect particles from the solar wind and cause some parts of the lunar surface to weather more slowly. Working with what is known about the intricate geometry of lunar swirls and the strengths of the magnetic fields associated with them, the researchers developed mathematical models for the geological “magnets.” They found that each swirl must stand above a magnetic object that is narrow and buried close to the moon’s surface. The picture is consistent with lava tubes, long, narrow structures formed by flowing lava during volcanic eruptions; or with lava dikes, vertical sheets of magma injected into the lunar crust. But this raised another question: How could lava tubes and dikes be so strongly magnetic? The answer lies in a reaction that may be unique to the moon’s environment at the time of those ancient eruptions, over 3 billion years ago. Past experiments have found that many moon rocks become highly magnetic when heated more than 600 degrees Celsius in an oxygen-free environment. That’s because certain minerals break down at high temperatures and release metallic iron. If there happens to be a strong enough magnetic field nearby, the newly formed iron will become magnetized along the direction of that field. This doesn’t normally happen on Earth, where free-floating oxygen binds with the iron. And it wouldn’t happen today on the moon, where there is no global magnetic field to magnetize the iron. But in a study published last year, Tikoo found that the moon’s ancient magnetic field lasted 1 billion to 2.5 billion years longer than had previously been thought—perhaps concurrent with the creation of lava tubes or dikes whose high iron content would have become strongly magnetic as they cooled. “No one had thought about this reaction in terms of explaining these unusually strong magnetic features on the moon. This was the final piece in the puzzle of understanding the magnetism that underlies these lunar swirls,” Tikoo says. The next step would be to actually visit a lunar swirl and study it directly. Tikoo serves on a committee that is proposing a rover mission to do just that.